In the pre-broadband days of the early '90s, Philips tried its luck with an advanced CD-based consumer product. This was CD-Interactive, or CD-i. As its name suggests, CD-i allowed users to 'interact' with specially-produced CD-ROMs. The CD-i player plugged into a TV set, and was supplied with a joypad remote control. Among the exciting content on offer were interactive encyclopedias, 'how-to' tutorials, artiste-exploring pop discs and even a handful of games - most of which sucked lemons (with the exception of Mad Dog McCree, an enjoyable arcade-derived 'shoot-out' that used a lightgun pistol). CD-i, which proved to be slow and unresponsive in use, could at least play audio CDs. Appearing shortly after CD-i was a competing (but completely-incompatible) CD-based system known as 3DO, which was enthusiastically supported by Panasonic in the form of its ARM-powered FZ-1 'interactive multiplayer'. Games were a lot better than those offered for CD-i - which, like Commodore's short-lived Amiga-based CDTV console, was hampered by an old-time Motorola 68000 processor. Alas, Sony's PlayStation proved infinitely superior for this particular 'killer' application than all of 'em, and sealed both their fates when it was launched in 1995. But there was more to CD-i and 3DO than interactive content; they introduced the concept of the VideoCD (which is completely different to the aforementioned CD-Video). With the exception of an obscure PSX variant, not even the PlayStation could do that! For both CD-i and 3DO players, you could buy a FMV (full motion video) add-on that allowed users to play movies, pop-video compilations and - yes - Mad Dog McCree, which used FMV to emulate the original arcade-version's Laserdisc-derived video sequences. VideoCD can be considered as the digital precursor of DVD, but this had its limitations. Early releases were often artifact-ridden, and the maximum 74 minutes running-time (MPEG-1 compression was used to cram both video and audio into the 1.4Mbps data transfer rate of uncompressed-PCM audio CDs) also meant that you had to swap over discs during the course of a typical movie. At best, the picture quality of VideoCD wasn't much better than VHS, although it was a lot more stable and free of 'drop-outs'. The format only really took off in Asia, where the prevailing humidity made discs more viable than VHS tapes. 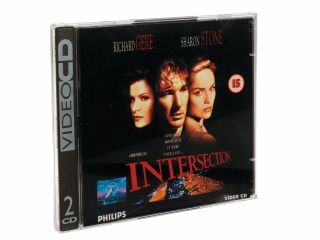 Eventually, VideoCD was eclipsed by DVD, although until DVD recorders became available in 2001 home-made VideoCDs (produced with stand-alone recorders or computer software) were embraced by UK video enthusiasts. Key to its popularity was the fact that most DVD players will also play VideoCDs, thanks to their Far-Eastern origins. A short-lived MPEG-2 variant, the Super VideoCD, also made a fleeting appearance. A half-way house between VideoCD and DVD in quality terms, this offered around 30 minutes per disc. This article first appeared in Home Cinema Choice (issue 149).